In an aggressive and athletic display of the finest that ladies tennis has to offer, Poland born Brit girl, Agnieszka Radwanska cruised through to the Wimbledon Ladies Singles final, after beating Angelique Kerber, of Germany in straight sets here today. It marks a significant milestone in the history of ladies tennis, being the first time ever that a Krakow born British player has reached the Wimbledon final. Since non-Krakow born Virginia Wade's Jubilee year triumph way back in 1977. "But I am not British. I am Polish," Agnieszka told reporters. "Let's be perfectly clear about this," PM David Cameron told a packed House of Commons this afternoon. "Polish is British, and British is Polish. There's no difference. We're as proud of Miss Radwanska's achievement as the Polish people are of Andy Murray's proud march to certain victory in the men's tournament. Andy has become a Polish national hero because he talks a bit like Sean Connery, and Agnieszka has become a hero here because we love the Polish. In fact, we love them so much that we're thinking of building a massive bridge between the two nations. The BNP aren't too keen on it, but we refuse to be dictated to by the terminally clueless." Tennis fanatic, Bernard Braithewaite from Burnley also gave his full support to Miss Radwanska. 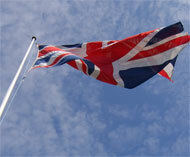 "I'm glad she's flying the flag for Britain," Mr Braithewaite announced. "I'm sure she'll take great pride in representing the union flag. Besides which, Burnley's very own Maria Sharapova proved to be a bit of a grunting anticlimax, and at least Agnieszka has long legs." "But I'm not British! I am Polish!" Miss Radwanska protested at a post match press conference. "Ignore her," press baron Rupert Murdoch told reporters. "She's had a long day and she's tired and dehydrated. If I say she's British, she's British. End of story." Miss Radwanska will face Serena Williams in the Ladies Singles final. Probably flying the Jolly Roger.